Foodbanks in principle stand against waste and poverty, which taken together forms a strong symbiotic connection. Preparation of boxes of food for distribution. From Monday to Wednesday, non-revenue food is picked up or delivered to the center. On Thursday, volunteers pack food parcels into crates, one for each family. On Thursday night, some food is given to larger dispensers, such as churches and community groups, from where subscribers to the service can pick it up. On Friday, the clients come to the center to pick up their food in normal shopping bags. In practice, there is overproduction and misproduction in the food industry. Without the Foodbank, a greater quantity of food would be destroyed. At the same time, low income households would also face hunger. The Foodbank prevents excess or non-revenue food from being destroyed, and also exposes the large amount of food that is being wasted. In the Netherlands, the first Foodbank was founded in 2002 by Jack and Clara Sies who began supporting 30 families in Rotterdam. Since then, the Foodbank has grown into a nationwide network of more than one hundred local food banks. The number of Dutch people on such a provision increased significantly in 2005. Also in 2005, the number of food banks increased from 22 in September to more than 40 in December. By 2006, it was estimated that 8000 households were using food banks. Of the people who rely on the Foodbank, 43% appear to have financial debt . 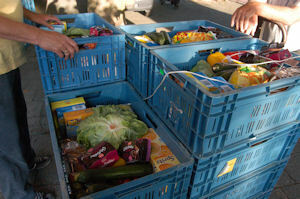 In late 2008, the national organization Food Banks Foundation Netherlands was established, thus connecting the eight regional Foodbanks in the Netherlands. The regional Foodbank issues a board member on the national board who comprises an independent chair of nine members. In the Netherlands, a social state, it is not often known that poverty exists. Part of the mission of the Foodbank is to help these marginalized people. The second goal for the Food Bank is to reduce waste. In the beginning, when the Foodbank wanted to expand beyond its initial 30 families, they started with a website and leaflets. The founders approached food producer Unilever, but did not get past the front door, as the food producers were not aware of what the Foodbank was. The Foodbank decided to call the local newspaper in November 2002. Overnight they were on television, radio, and newspapers: everyone wanted to know what the Foodbank was, and doors were opened. Now, the Foodbank benefits from very strong brand recognition. In accordance with the Commodities Act, food products past date are discarded. Furthermore, most supermarkets will not shelve food that has an expiration date coming up within a week, so a niche is created for getting rid of this non-revenue food that is still edible, but cannot pass quickly enough through the conventional supermarket distribution chain. Furthermore, other non-revenue food, such as mislabeled products, would actually cost money to be destroyed by conventional means, so by donating to the Foodbank, the food producers can save money. Incredibly, the entire national Foodbank network is volunteer run, all the way from the CEO's to the packers to the distribution centers. The founders, Jack and Clara Sies, still subscribe to the Foodbank service. Consistency of supply can be a problem, especially for fresh vegetables. When there is not enough fresh food coming in, the Foodbank has to dip into cans and jars from their store to supplement the supply. Since the recession, the producers are being a bit tighter with their production chains. Now the food can be a lot of the same, such as potato chips for weeks. If it continues this way, the growth of the number of people seeking assistance and the lowering amount of food delivery could become a problem. But Foodbank always could deliver something. The initiators were Jack and Clara Sies. They were assisted by the media and food producers. Since then, others have been inspired and started Foodbanks in their own regions. Local governments have not always been happy or helpful towards the project, as they would like to think that poverty does not exist. The Foodbank has been careful to not accept structural subsidies, as to be free to work they way you want to work and to avoid being swallowed by bureaucracy. Sometimes with the food producers, the Foodbank had to lobby, while others came on their own accord. Foodbanks starting now can connect to the European federation of foodbanks. In each country, Foodbanks fulfill slightly different roles. For example, in Poland, the Foodbank is part of the government and provides meals in schools. In Germany, Foodbanks also grow food. However, in principle, all Foodbanks are against poverty and waste. 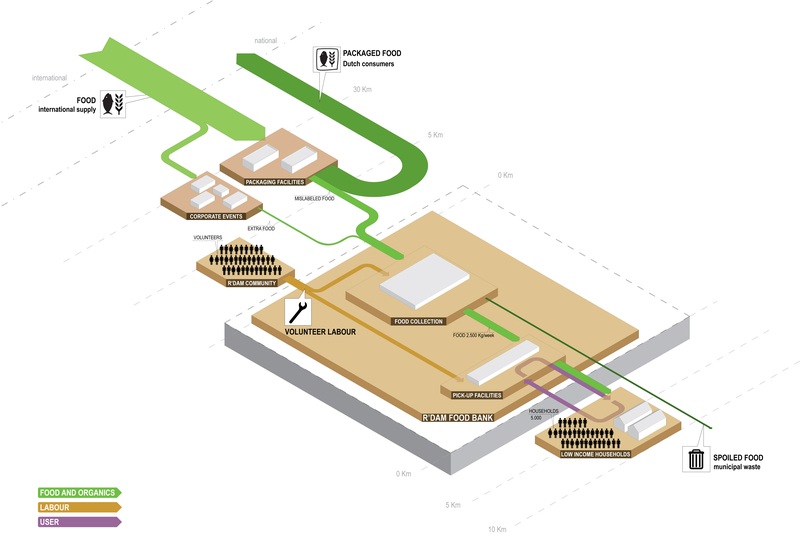 2012architecten, Anna Brambilla Processes and actors are identified by labeled platforms with sub-processes shown as stacked platforms. The system boundary is shown as an extruded block indicating that it is one piece within a larger network. Starting from the edges of the cyclifier, distances are marked in intervals to indicate the distances traveled by inputs and outputs. Flows are scaled by mass as in sankey diagrams and are color-coded per flow type. Flows to and from the atmosphere are represented as traveling vertically.